by Anita L. Bradshaw. Skylight Paths Publishing, 2015. 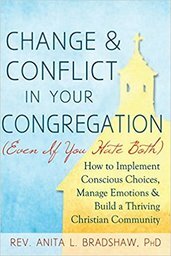 This book offers a clear path toward a practical theology of change, acknowledging the constructive value of conflict as a healthy mechanism that moves congregations forward. With a pastoral tone, and the benefit of long experience, United Church of Christ pastor and teacher, Anita Bradshaw, sets a scriptural context, addresses fear, and frames a positive role for conflict in churches that wish to have a vital internal culture. The concluding chapter describes how congregations seeking to change their identity in a positive, productive way can learn how systems within a congregation work, identify imbalances and release limitations. With this in place, a congregation can begin to tell a new story about its identity, purpose, and future. Particularly useful for congregations are the practical techniques and prompts around narrative theology, empowering congregations to understand and then shape their own story. Bradshaw rejects black and white thinking about what makes a congregation “healthy” or “thriving,” but instead focuses on a new future for the congregation that is called by God.